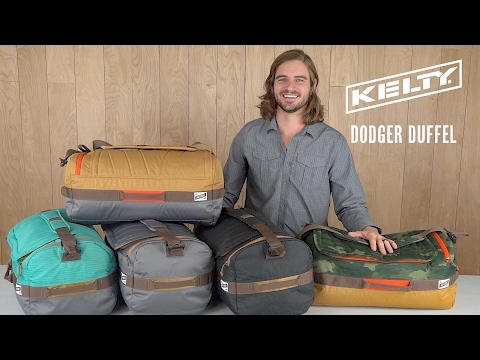 With 40 liters of thoughtfully designed duffely goodness, the Dodger Duffel is a solid addition to any gear closet. A fully padded exterior provides additional protection and structure. This keeps the duffel from collapsing during packing, but is still flexible enough to stuff down for storage. The padded AirMesh shoulder strap features a quick-cinch adjustment so you can switch from shoulder carry to messenger carry with ease. Grab-and-go handles are conveniently positioned on all four sides for quick transitions from the car or airplane overhead compartment. Two internal accessory pockets, plus a zippered end pocket, keep your stuff organized, while the hidden “safety” pocket is perfect for any other “essentials” (wink wink). Part of the Built to Wander collection, the Dodger Duffel blends fun, function, and grab-and-go spontaneity for truly kickass gear. Music festivals, days at the park, nights under the stars…where will you wander? Very lights and folds up small. Very big in size and can hold alot. Multiple handles for easy carrying . Very new and stylish design . Weighs pretty much nothing but is big enough to hold a decent amount of things. Color selection isn't the best but that's no biggie.